While I was away, a large quantity of e-mails stacked up, adding to the quantity that was there before I left (and I promised that I would get to - remember that?) and I only made a minor dent in them this weekend because, after all, the TV wasn't going to watch itself! During my absence, I got tagged and although this is soooo "last week", I'm going to answer anyway since Becky is counting on me. Actually, Becky is in Vegas and I'm sure my answers to this tag are the furthest thing from her mind, but let's just pretend otherwise, shall we? First time you got kissed. How was it? Well I'm not sure this was the first time I got kissed, because I seem to remember a couple of times in middle school where I would check "yes" on the "Will you go with me? Yes, No, Maybe" notes, and it seems logical that those deep relationships spawned from notebook paper would produce a peck or two. However, my first real kiss, with butterflies and everything, was the summer after 8th grade, with Corey, who was a year older than me and already in high school. It was the different schools that made me unaware of his "questionable" status, sexuality-wise. Sure, he had a squeaky voice, but didn't all guys at 14-15? Sure, he was the manager of the girl's tennis team, but that's just because we lived in a small town that didn't have a boy's tennis team. He was really quite gifted at tennis, darn it! OK, yes, he did walk with a slight swish in his step, but those Levi's 501's looked FABULOUS on his tush, sashaying or otherwise! If he did turn out to be gay, then all I can say is, judging by his kissing abilities - some guy out there is a VERY lucky man! First time you drove a car. What kind of car? My parents bought two new Nissan Sentra's right before I got my driver's license. I liked the silver one best, and that's the one they let me zip around town in on the day I passed my test. About a year later my dad gave me my first car - a 1972 Oldsmobile Cutlass in baby-poop brown. It was not a cool car and I wasn't quite mature enough to understand the importance of transportation versus status. I would park it as far out in the school parking lot as I could, and I would wait till everyone else left before claiming it. More than a few times I flopped myself down across the voluminous bench seat and waited for someone to walk by, hoping they didn't see me. Eventually I gave the car back to Dad, claiming that I couldn't afford the gas and insurance, but the truth was that I just wasn't secure enough, socially. My best friend Kay had a sports car. I decided to ride everywhere with her. 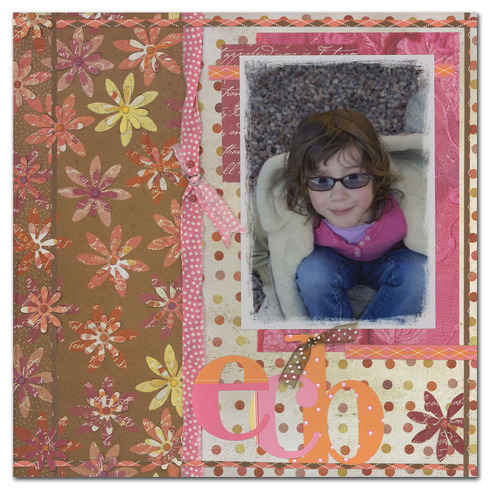 First time you scrapbooked. When you look at your page do you love it? First time you went on a date. Where did you go and with who? Hmmm, that's a toughie. In our very small town we didn't do "dates" as much as just going to a high school dance or football game. However, I remember one time being asked out on a real date to the movies by Sean, who was two years older than me. He used to wear Army fatigues to school and was definitely not in the cool crowd, but he was smart and funny and those are the two traits that I find irresistable in a guy. I can't remember the movie, and it wasn't a love connection, but only because I was too worried about his "uncool" status. (Think Randy, from Valley Girl) I was home from college several summers later, much the wiser, and found out that he was married. When I saw him my stomach flipped and I regretted that, once again, I had let fear rob me of something that could have been. First time you fell in love. How did you know? Well as sappy as this is going to sound, I'm not sure I was ever in love before John. Oh sure, I had boyfriends and I threw the word around a lot, but when the real thing came around - it stuck! First time you cooked for someone. Was it yummy? What did you make? I am not particularly known for my culinary abilities. I make passable meals of reasonable tastiness. I'm sure I did cook for someone a first time, but it wouldn't stick in my memory, since the meal was, at best, just average. First time you got on a plane. Where did you go? Were you scared? Disneyland. I was 12, I think. My parents' marriage reached the breaking point on that trip and they separated soon afterwards, but I don't remember any of that. They told me about it later. The trip and the plane ride were absolutely thrilling to me and my siblings, who, up until then, had never been on a "real" vacation. Mostly we went camping or visited relatives. First time you shaved your legs. Did you cut yourself? Don't remember the age - probably 5th or 6th grade, but I certainly remember taking a chunk out of my shin. Yikes! First time you put on make up. Looking back how did you do? Did you look good or like a clown? I was not allowed to wear makeup until 7th grade. The day after 6th grade ended (so the first day of summer vacation) Kay and I went to Safeway and she helped me pick out some makeup. My mother was shocked to see me in it, but I pointed out that since I was no longer a 6th grader, I must be a 7th grader and therefore makeup was fair game. (Logic, so good at the logic!) Mom didn't argue with me and I had the whole summer to work on not looking like a clown. I failed. But I blame Kay. She had pretty blue eyes and the blue eyeshadow was less clown-like on her. I had brown-hazel eyes and looked, in a word, ridiculous! First time you moved out of your home. Was it an apartment, house, etc? I moved into Butler Hall, a freshman dormitory at Tulane University, in New Orleans. I was barely 18, naive, a long way from the small Oregon town where I'd lived my whole life, poor as a church mouse, and scared to death. My roommate was a wealthy princess-type from old Oklahoma oil money, with an extensive wardrobe and an overbearing mother intent on reliving her sorority days. We made an unlikely pair - she was the goddess from 16 Candles and I was the nerd from Square Pegs. Eventually, though, we became friends, and helped each other navigate the rough waters of out-of-state college. She ended up going home for the second semester and came back the following year with a new appreciation for academics, but by then we moved in different circles and the friendship drifted away. In funny footnotes, I ran into my freshman-year roommate a few years back at a Tulane alumni crawfish boil here in Colorado. We were surprised at the coincidence of us both ending up here, and we promised to stay in touch. We didn't, of course. 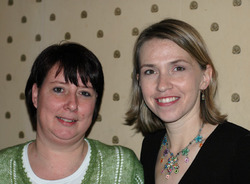 The crossing of our paths almost twenty years ago is a fond memory. You would think that helping each other survive the terror of instant adulthood would bond us forever, but the truth was that it was a friendship based on proximity and vulnerability. We never had much in common. Sad, when you think of it. OK, that's enough waxing poetic for one post. I am not tagging anyone with this one since I think it's run its course. Wow! Can I just say how awesome it is to get so many comments on my blog?! I love it! Thank you so much! Well CHA is right around the corner but I won't be there this year. It was too close to my Holland trip and since I have a small release and the themes are rather self-explanatory, I'm sitting this one out. 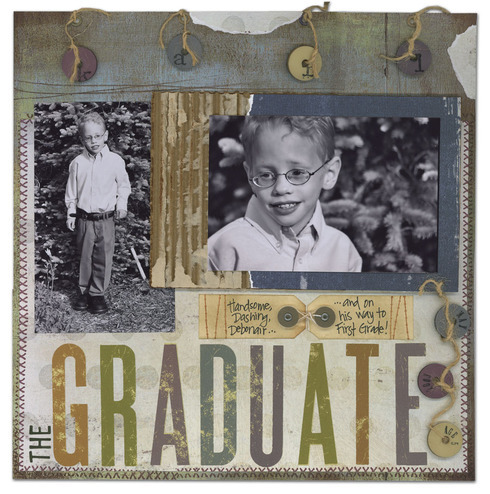 For the non-scrapbookers who are reading this, CHA is the biggest craft trade show of the year where manufacturers release new products and take orders from retailers. Want to see what's coming? 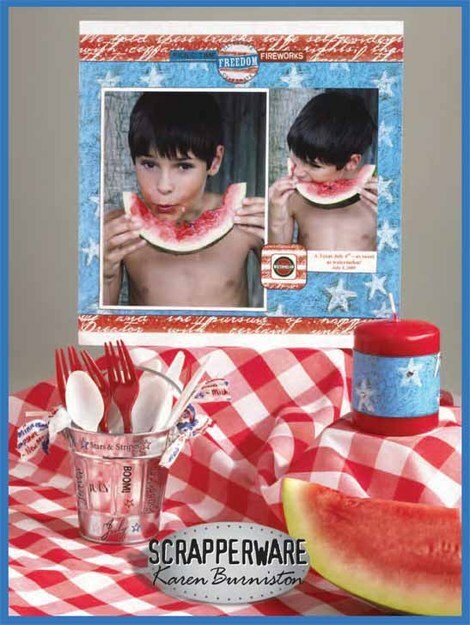 Here are my two new collections - Americana and Birthday. 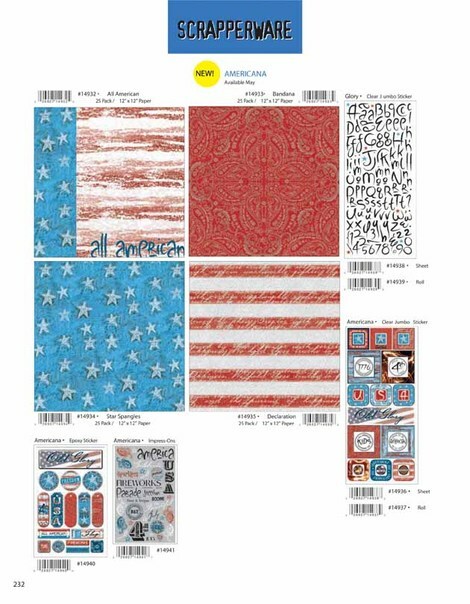 The Americana collection has four papers, two stickers (one alphabet, one imagery), a rub-on sheet and an epoxy sticker sheet. 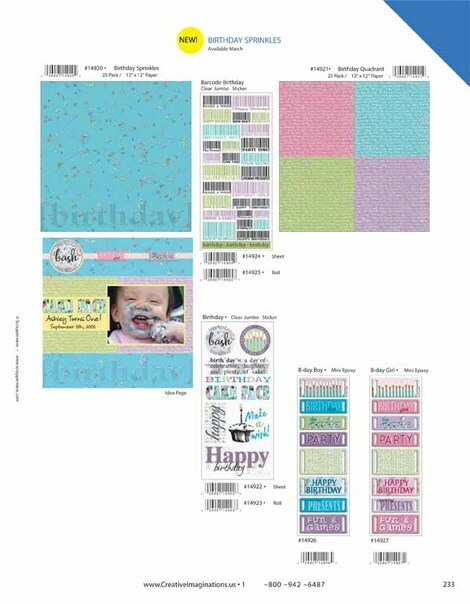 The Birthday collection has two papers, two stickers (the barcodes are stickers this time - thought we'd offer an alternative to rub-ons) and two mini-epoxy sticker sheets. 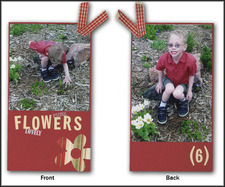 The epoxy stickers are ribbon slides, but you could also throw a strip of paper through there or hang them from something or add a flower or . . . you know, get creative! 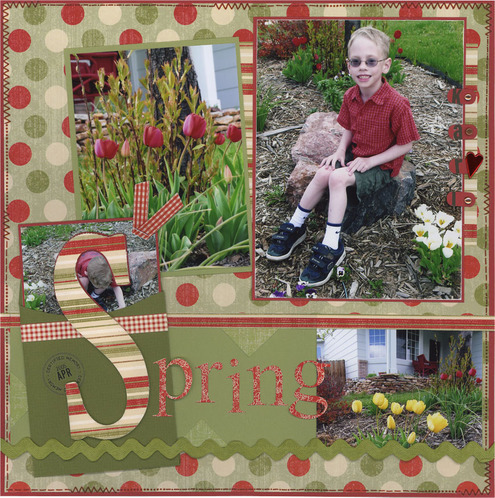 And I also wanted to post this page that starts my section in the Creative Imaginations catalog. Our newest design team member, Kitty Foster made the projects. See how she used the rub-ons to decorate the little tin silverware pail? How cool is that?! EDITED! Sorry - not sure why the red X's were there but they seem to be fixed now! Wow! My trip to Holland was an adventure to say the least, but absolutely memorable and I can't wait to visit again. My adventures started with a snowstorm. About halfway to the airport the snow started. It only got worse. It took an hour to drive 15 miles. When I finally made it to the toll road it was two hours before my flight and I was still 35 miles away and driving in blinding snow. I started to wonder if I would miss the flight. My mother called to check on me and said that she'd been in traffic for an hour trying to get to her job five miles from home. It was bad. Bad, bad, yucky, blinding snow. But then something nice and unexpected happened - the car in front of me paid my toll. I told Mom; "This is a sign! I'm going to make it to the airport in time, I'm just sure of it!" I made it to the aiport in time. I got tagged for secondary security and had to be patted down and my bags searched, but I wasn't worried. Things were looking up. The jet we had boarded was very much down. Down on the ground. Waiting for de-icing. And waiting. And waiting. And waiting. As far as my eyes could see there were jets waiting to be de-iced. You really don't want them to rush a thing like that, but this was looking bleak as far as making my connecting flight. They started a movie while we sat. Not some small featurette or an old episode of Will & Grace. A MOVIE. This couldn't be good. I called Heidi and told her I was going to miss my connection in Washington. I was right. I'm right a lot. They re-routed me through London, where I switched to another terminal and another airline, and finally, seven hours later than my original arrival time, I made it to Amsterdam. I was tired, stressed, rumpled and not looking my best, but hey, it couldn't get worse, right? I'm wrong a lot, too. They lost my bags. Both of them. Had no clue where they were. Those little barcodes and fancy computers are just a front, I guess. In actuality they have to ask Ferdinand (or some other baggage handler) to personally sift through the luggage to find the missing pieces. You have to describe the luggage so they can find it. Do you know the brand names of your suitcases? I didn't. My carry-ons consisted of my camera, a squish pillow, a projector and laptop, The Princess Bride 25th anniversary edition book, an empty bag of Whoppers that were consumed somewhere over the Atlantic, and, quite luckily, my makeup bag. My carry-ons DID NOT include anything remotely resembling clothes or a toothbrush, so I was stuck in frumpy gray sweatpants, a wrinkled hoodie and I had Whoppers in my teeth. I held it together remarkably well, filling out the lost luggage forms with only the slightest of lip quivers, but of course I burst into tears right after breezing through Customs with my minimal possessions. Heidi and the girls were there to greet me and I desperately tried to stop crying. I still had a workshop to teach, after all. After an hour on the road and easily another hour to go, we were brainstorming new plans. One included hopping off the highway and putting me on a train, which wouldn't have been too bad, considering I was traveling light. In the end, though, the store did something very nice and very brave. They said they'd teach the class themselves. I had forwarded the instructions ahead of time, but they had not seen the original project to truly understand the interactive features. I didn't know the store owners and design team yet, but if I had, I would have known that there was nothing to worry about. The owners, employees and design team of Akke-Fietje are, quite simply, marvelous. So back Heidi and I went to Amsterdam, where we took a quick 15-minute power shopping trip for a pair of jeans, a tee-shirt, sweater, undies and a toothbrush. European sizes are different from American, but it was all managed in the end. Early the next morning we headed back to Akke-Fietje and made it without further incident. The workshops went swimmingly. Debby and Agitte helped with the translations, but for the most part everyone spoke English. Debby had taught the class the night before and did a fabulous job. When I saw the project they created it looked identical to mine and I didn't feel particularly special anymore. I rarely do, though. Feel special, I mean. I am in constant awe that people will come to my workshops when they could easily teach me a thing or two. (Or three, or four, or infinity) That's true of American workshops and it's no different in Holland. The talent overflows. Seriously - you should check out the work of Akke-Fietje's design team and then tell me if you'd like to have a couple of them in your class! Intimidating!! Oh, and I see that there are already photos from the weekend on Akke-Fietje's website, so you can check out their lovely store and my lovely outfit, if you're so inclined. Sunday's workshop also went well, especially after my bags arrived that morning and I was able to put on clean clothes. I was excited to see my friends Lida, her daughter Loeske and Hetty there. I had met them at the Scrap-a-Ganza events. They gave me a ride back into Amsterdam and we all went out to dinner with Heidi's family. Lida won the album contest at a previous Scrap-a-Ganza and is one of the most talented crafters I've ever met. I was excited to hear that she'll be teaching one of the album tracks at this year's event, so if you're going - don't miss her class! Hetty was helping me make some tags when she noticed my purple Fiskars microtip scissors and said that she liked the purple color and needed a pair like that. "Oh you mean YOUR scissors?" I said, holding them up. "No," she protested, but it was no use. I threatened to give back her necklace if she didn't take the scissors and thank goodness she didn't call my bluff because I think I would have died in agony if I truly had to return that necklace. From then on I would tell anyone who would listen that "me make 'um good trade" with regards to a pair of used purple scissors for a beautiful piece of jewelry. Of course, the kidney offer still stands and the box of goodies will be sent pronto, but I'm still the winner of the deal, methinks! Heidi lives right on one of the picturesque canals of Amsterdam, by the way, so having the oppportunity to stay at her house and enjoy her family was a treat. There wasn't any time for sightseeing, but I've been there twice already, and what I really took from this trip, more than the others, was friendships that I will treasure forever. Well this has already been a long post, so I'll only relay the highlights of the long journey home. My return flight was on Lufthansa, routed through Frankfurt, and I was happy when I booked it that I would be going through US Customs at home in Denver instead of Chicago where I would have to make a connection. I didn't consider that Lufthansa, being a German airline, would mostly employ Germans, serve German food, have mostly German passengers and a German in-flight magazine. I love Europe and it's hard to leave, but once you're on the airplane, well, you start missing the familiarities of home and a large icy Diet Coke is a nice consolation. I had a window seat, which was nice for sleeping, but the flight was 10.5 hours - you can't sleep the whole time! Unless, that is, you're Rip van Winkle, who happened to be seated next to me in the aisle seat. This guy could sleep! He was German, and the only thing worse than his English was my German, so no conversation was going to occur. Although the Coke Light cans are sized for Oompa-Loompas and two cubes of ice is considered generous, I did manage to consume enough liquid to require getting up. Only Rip wouldn't stop sleeping and he wouldn't stop snoring! Finally I just climbed right over him. The food was very German, too. My choices were "Beef" and "Kichenstorifsonezecklenstienshnitzel" or something like that. I asked her to repeat it, but she said the same unintelligible thing, so I determined that my problem was not that I was deaf but rather that I was American. I stuck with the beef. They'll give you as much beer and wine as you want, so when Rip wasn't sleeping he was listening to German music on his headphones, sipping red wine, and singing along. I credit the wine with helping him maintain perfect composure when, a half hour before landing, the flight attendant came to inform him that his luggage was not on the plane. Been there, done that, I thought to myself. At least they KNEW where his bag was and were probably sending it on the next flight. I'm not sure what was being promised because after she told him in English that his bag was missing he said "Deutsche" and then I couldn't eavesdrop anymore. Now I'm not sure who Murphy was and how he came to be credited with a law, but I discovered that it is a universal law, or, at the very least, applicable to Germans as well as to Americans. I say this because not two minutes after learning that he would not be collecting luggage and would not be in possession of a change of clothes, Rip spilled his red wine all over himself. German curse words are remarkably similar to American curse words. The poor fellow did his noble best, but we're talking red wine on tan corduroy here. He wasn't Miracle Max and even after a trip to the restroom it looked like he'd been stabbed in the thigh. My bags came out third to last. I didn't worry because I found it statistically unlikely for them to lose my bags twice. OK, I'm lying. I did worry. I was keeping track of how many other people from my flight were waiting. I didn't panic until both "pointy brown wingtips" and "stuffed parachute pants" got their bags. Speaking of stuffed parachute pants, I was fascinated by how much stuff he had in those pockets. It took a lot of restraint not to say "Hey Napoleon, give me some of your tots!" But my bags did come. I made it home in record time, enjoyed makeshift dinner (hotdogs, chips and fruit) with my family, got a hot shower, and watched American Idol. I only mention our dinner menu so you will understand the heinous nature of our carpets after Emma threw up, twice, in the middle of the night while attempting to make it down the hall to tell us she was sick. Oh, and Karl told us right before bed that his book report was due today. Murphy - I tip my hat to you. So today has consisted of: nursing a sick child, pleading for an extension with a reading teacher, scheduling carpet cleaners (they came today and boy are they miracle workers! ), responding to just some of 147 new e-mails that arrived in my absence, and of greatest importance of all . . . updating my blog! We cleared out the storage room yesterday. It was a frightening and overwhelming task, seeing as how the floor was completely undetectable. There was the requisite pile of junk - outgrown toys, a bin of dried-up Playdoh, home improvement leftovers, several boxes of "memorabilia" that haven't been unpacked for the last 3 moves, etc., etc. There was also a decent amount of acceptable storage room inventory - holiday decorations, leaves for the dining room table, extra chairs, etc., etc., but mostly the room was filled with empty boxes. How many boxes did John contribute to the storage room disaster? My sources say zero. How many boxes did Karen contribute to the storage room disaster? Signs point to plethora. Hoarding boxes is a noble affliction, with a long and glorious tradition. My problem started, as most things do, in childhood. My mother was then, and remains today (although she's lazed up a bit), a very practical woman. We had a closet upstairs where we kept empty boxes. If you needed a box to wrap a present or mail a package you just headed to the box closet. We kept shoe boxes, jewelry boxes, hat boxes, big boxes, small boxes, flat boxes, tall boxes, round boxes, mailboxes, boxes in the shape of Oklahoma . . . you get the idea. I did not inherit all of my mother's practical ways and unfortunately very few of the ones that would save me money. However, the box hoarding gene was passed on with full strength, unmutated and undiminished. The storage room has held my dirty little secret for quite some time. And not a neat and orderly dirty little secret. Oh no. The boxes were not collapsed and stacked as you see in the photo. That's John's handiwork preparing them for their journey out of here. Prior to yesterday the boxes were shoved unceremoniously into the storage room in whatever shape they arrived, full of whatever packing materials they arrived with, and at times resembling an intricate structure of awe-inspiring and gravity-defying artistry. I'm nothing if not an arteest. Heh. The intervention was long overdue. I was permitted to keep just a few boxes, collapsed and orderly, in one bin that holds my mailing supplies. Between Priority Mail boxes, FedEx boxes and this new fangled thing called "shipping boxes for sale," it has been decided that I will not suffer any major hardships finding boxes for future mailings. I also found some old photos while clearing out the storage room, and, as you'll see, this "box affliction" has plagued me from a very early age. Here I am at 6 months, age 2, and a senior in high school. Although you may be thinking that I had chubby cheeks as a child/teenager . . . think again. 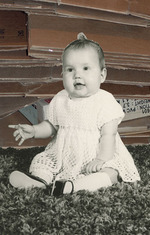 I stored small boxes in my cheeks, chipmunk-style, in case of emergency.You just never know when you may need to mail a pacifier, small toy or hair scrunchie, after all! 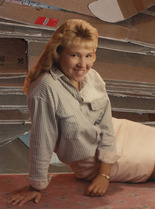 Speaking of hair - that is some FABULOUS 80's hair I'm sporting in the oh-so-natural sit-on-a-peach-rug senior portrait, no? Notice my bangs, perfectly rounded into a surfer's barrel and set with half a can of Aqua-net. 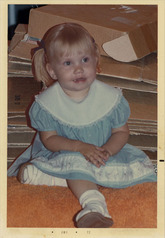 Apparently I never outgrew sitting on carpeting, either. So by now I'm sure you've discovered my deep and dividing interest in boxes. At present I'm writing the definitive work on the subject, so I want you to be totally honest with me on how boxes make you feel. And remember, this is for posterity, so be honest. Heh. OK, that's enough silliness for today. Thanks to everyone for the lovely comments on my layouts and for wishing embarrassment on me. Surely this qualifies, no? Must I refer you back to the bangs? You may not hear from me again for a week, but in that time I will surely be taking notes of all I see and do that is amusing and blogworthy. I'm heading for Holland. Veel liefs! What a lovely Saturday! Emma went out bright and early with John and sold half of her cookie goal in just a couple of hours. (Oooh, and it was a good thing she did, too - the Brownies were out in force and the competition was fierce. It's a cutthroat business, those cookies! *shiver*) Sandy drove down and we had a delightful time at Ev's Pampered Chef party and then went out scrap-shopping. I picked up the Basic Grey notch tool, which I have really been wanting, a couple of rubber stamps, rub-ons, stickers, and a few sheets of paper. Naturally I wanted to dive right in to my new purchases, so I did! Oh sure, I'll pay for it with a few late nights getting ready for Holland, but playing with new purchases is just so. much. fun! Pretty obvious how much I like that notch tool, huh? hee hee. Oh, and I used my new foam stamps (meaning MY foam stamps - Scrapperware brand) that are now available in stores, so I'll just pop up a visual so you can see them. I think they're pretty nifty since the words are already done for you. AND, they're mounted on clear acrylic so you can see EXACTLY where you're placing them. EXACTLY! (Have I mentioned EXACTLY?!) 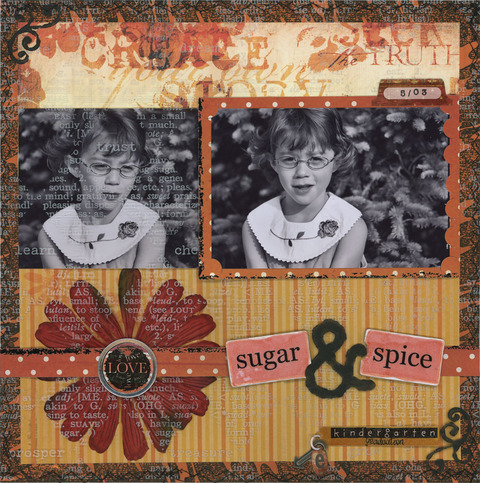 I used the ampersand and the flourishes on this layout. And just because I don't have anything particularly funny to share, I'll throw in yet another layout that I did at last weekend's crop. Both of these layouts are posted in my 2Peas gallery with full supply lists so can I be lazy and just not type them up again? Thanks. I owe a bunch of folks e-mails and I plan to get to all of them . . . someday. Heh No, really, I will get caught up soon, I promise. I hope to be all caught up by the time I head to the airport on Thursday. That's my goal. So that's all I got. Sad but true. Nothing amusing at all. Narry a chuckle. Haven't embarrassed myself in the last 48 hours, amazingly enough. There's always tomorrow! I got tagged by Gretchen , Karen R. AND just now by Mary while I was typing up my answers! I feel VERY popular and important. In fact, I think I should probably refer to myself in the third person, since there doesn't seem to be a tiara involved. Potatoes - mashed, baked, twice-baked, thrice-baked, fried, fricasseed, roasted, charbroiled, hash-browned, chipped, stuffed, skinned, plain, loaded, boiled, made into potato stamps, carved into a sculpture . . . you get the idea. Karen and low-carb diets do not mix! Reading the scripts for the next ten episodes of LOST and then dedicating that half of my brain to something more worthwhile. Well that was a fun diversion! Now Karen must go prepare a delicious baked potato. And by "baked", Karen means a microwave-ready potato for which she paid the ridiculous sum of 69 cents just so she doesn't have to scrub it herself and poke it with a fork. Karen cannot be bothered with trifling little chores like scrubbing and poking potatoes because, as one of John's co-workers so wisely pointed out; the internet isn't going to surf itself! If anyone saw Scrubs last week you'll be familiar with blonde-doctor's hysterical nickname of "Bankfarter". In a nutshell, her friend told her co-workers about a time that they were in line for the ATM and blonde-doctor whispered to Carla that her chimichanga was barking and she needed to . . . uh . . .let one go. Carla noticed all the men in line and advised blonde-doctor to just do it, since they would likely assume it was one of the men. Blonde-doctor let it go, only to have one of the men say "Hey, I think that blonde girl farted!" After Carla told the story at blonde-doctor's work, everyone started calling her "Bankfarter." "Hey Bankfarter - we need you in the staff room" "Where's Mrs. Adams' chart, Bankfarter?" "Exam Room 2 is open, Bankfarter" etc., etc. So, so very funny! Until, that is, I earned my own bank nickname this morning. I took Karl to Physical Therapy this morning, which is in a pediatrician's office, and rather than sit in the waiting room for an hour with my Sudoku puzzle, listening to hacking children, watching the fish swim around in the tank, thumbing through Parents and Healthy Baby magazines (What? pediatricians are too good for People?!) and generally being bored out of my gourd, I decided to run to the post office to mail a package and get some of those 2-cent stamps so that my Christmas stamps, which were not used for Christmas cards (Please. What was I thinking? Buy some stamps and the cards write themselves?) can be salvaged for paying bills. Apparently 8:30 is an excellent time to hit the post office. I was in and out in no time at all, leaving plenty of time for drive-thru breakfast (a treat! a treat!) and an opportunity to deposit a check that's been in my purse for two weeks. It was 8:42 when I parked in front of the bank, wiping biscuit crumbs from my mouth and marveling at my front-row parking spot. A truck pulled in beside me so I hurried to get out, planning to foil whatever plans this lady had to get in front of me in line. There are two automatic doors to enter the bank and the first one opened right up but the second one . . . did not. I jumped on the sensor a couple of times and then, as if waking from a dull fog, glanced at the "Bank hours" sign painted so prominently on the locked door. NINE O' CLOCK?! What? Really? I thought "bankers hours" was just an expression. You know, like "greatest thing since sliced bread" or "crazy like a dolphin." After the confusion lifted, the embarrassment set in. Banks are made of glass, as everyone knows, and glass is really good at being seen through, as this glass was currently being seen through by all the bank workers and security personnel. I turned quickly, trying to avoid seeing what I imagined to be extreme laughter, coffee spewing, donut choking, pointing, chuckling, comments like "Mrs. Dŭmăs must have some early morning banking to do! ", and the likelihood that I would win the grand prize at next year's holiday party "Security Camera Bloopers" event. Ah, but then I remembered the lady in the truck! Redemption! I wasn't the only idiot! Misery loves company! She was just stepping through the outer door when I looked at her and said, in a shocked voice, "The bank doesn't open until 9!" And then she gave me "the look". "The look" is the one that Vizzini gave the Man in Black when he put the poison in the goblets and then did a little mid-air shell game with them before placing them back on the rock table. A little backy-forthy move that was so cheesy and unimpressive that Vizzini responded with "the look." A combination of shock, disdain, amusement and boredom. A half-smirk, combined with an audible "Hmmph", that clearly conveyed how much he considered the Man in Black to be a half-wit. And yet, wrapped up in that word were so many conveyed feelings; pity, amusement, superiority, disdain. She was obviously insulted that I tried to recruit her into my idiot club, and, to prove it, raised her hand ever so slightly so its contents would float into my field of vision. She held a puffy zippered bank envelope. Talk about a shot to the heart! Nothing screams "experienced bank customer" like the puffy zippered bank envelope. They don't give those out to just anybody you know! You have to be a regular. A daily depositor. A big shot. You get your own slot, after all! Sure enough, she pranced right by me and deposited her puffy zippered bank envelope into the slot, giving a little half-wave to the bank employees and exchanging a superior smirk with regards to me. Well, I'm not sure about the smirk because I was slinking back to my van at that point, but I can imagine! I spent the rest of the drive back to P.T. with a flushed face, trying to recover my dignity by railing against the smug woman and the unjustness of banker's hours. What kind of modern-day business opens at 9 am?! If they opened at a reasonable hour they could retire all of their puffy zippered bank envelopes, plug up the slot with some additional mocking-friendly glass, and require Ms. Smuggy Smuggerson to haul her superior hiney into the bank and stand in line with the rest of us! The dirty people. The unfortunate shmucks who just want to deposit a stinkin' check and get on with our day, thank you very much! Grumble. Grumble. Grrrrrrrr. But I'm over it now. I'm fine. Truly. I wasn't really upset. And so. . . you may now call me . . . The greatest thing since . . .
Wouldn't it be kind of cool to author a household expression? I mean, think of the first person to say "That's the greatest thing since sliced bread!" Did he/she know that it would become so popular that every nifty thing that's been invented since doesn't become the new benchmark? I mean, I can think of a few post-sliced-bread inventions that rank pretty high on the impress-o-meter. I'd slice my own bread before giving up Moxie 2, my digital camera or the automatic sliding door on my van, for instance. Or how about the pots that have a pasta strainer built into the lid? Im-press-ive! CDs, DVDs, probably a few vaccines, cell phones, the clapper, fart machines, The Princess Bride, instant hand sanitizer, textured cardstock, shopping carts that look like race cars . . . there are plenty of candidates! And still, STILL, sliced bread gets the nod. Kudos to the coiner, I say. You coined yourself a keeper. Bravo. I bow. I bow. "Crazy like a fox!" - that's another one. Why a fox? There are plenty of sane animals, I think. Obviously not penguins, that's a given, and rhinos seem sort of short-tempered, but how about dolphins? They seem highly smart, ingenious and un-crazy. What? What's that you say? I'm crazy? Yeah, crazy like a DOLPHIN! So back on the subject of foxes, Ev and I saw one on our walk this morning. It was brutally cold and I wanted to wimp out but Ev is such a tyrant. "Let's just take a short walk," she suggested, lips still in the thawed position, after bopping out of her warm house with her fancy new hairdo. I, on the other hand, had just endured the brutal chill of walking to school where I had stood shivering with the other moms, teeth chattering, and willing the bell to ring. But since my lips were frozen I couldn't say no. So there we were, walking through our very paved neighborhood when we saw the FOX! He was right across the street from us! We watched, gape faced, as he ran across the street, up onto a fence, back across the street, headed straight for us (Swiper, no swiping!) went around us and down by the drainage ditch. We're really very lucky that no bugs flew into our mouths, come to think of it. The bugs weren't crazy enough to be out in the weather, though, so there's that. Yes, I know our hands are tucked into disembodied pockets, but these are SCHEMATICS, people, schematics. I am not so much the drawer of grand repute. Either that or it was so cold that our hands fell off. You can imagine it either way. 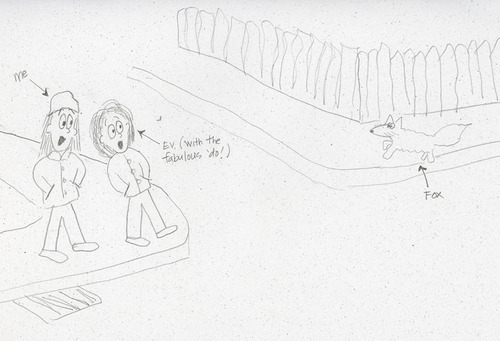 So what do you think of the drawings? No, I'm not talking "art critic" opinions. We've already covered that in the previous paragraph. No, I mean, do they add anything to the story? It's rather fun to draw up little cartoons. I could get into that. My best friend growing up, Kay, and I would swap notes in high school with little drawings of the events of the day. 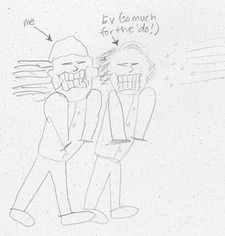 The drawings were always the funnest part, both to draw and to receive. In TV talk (sorry Sharyn) the re-runs are almost over! I liken the last month to the long winter in Narnia only slightly better because in Narnia it was always winter with no Christmas and here it was always re-runs but we had Christmas. So not as bad. Oh, and we didn't get turned to stone either. So two things better. Lots of good TV this week. Yippee! oxymoron n A figure of speech in which incongruous or contradictory terms are combined, as in "a deafening silence" or "an adult male". OK, so I added the part about the adult male, but I wonder sometimes. I truly wonder. Case in point: recently I returned from an errand to find John and the kids completely absorbed in The Three Stooges. He had apparently recorded several episodes, which I find very reckless, seeing as how Moxie 2 (our DVR) is a female. Recording something so inherently dumb could have easily fried her circuitry, I imagine. But there they sat, lined up on the couch with matching Forrest Gump head tilts, chuckling away like dopes. Second case in point: Karl gave Emma a Magic 8 Ball for Christmas and they've been fighting over the thing ever since. Karl keeps taking it from Emma's room and then she moans; "He's going to KEEP it!" and no matter how many times I logically point out that he can't "keep" it when we all live in the same house and she can just take it back when he gets tired of it, she still whines and complains. And if I point out to Karl that it is, in fact, Emma's toy and he should respect her wishes, he throws a fit and doesn't understand why he can't play with it if she's not using it. You know . . . kids. So last week when John came home early and offered to take the kids swimming so I could have a sanity break, I asked if he'd mind running to the store afterward and letting Karl buy his own Magic 8 Ball with his Christmas money. Seemed like a perfectly logical plan, no? I am, after all, a superhero. Er, no, no, sorry - that's Larry Boy. I am, after all, a female. Did they come home with an 8 ball? My sources say no. Outlook not so good. Better not tell you now. Don't count on it. My answer is NO. Never send a man to do . . . .hmmm, too many things to list. So anyway, Karl DID spend his Christmas money. He just found something that he wanted even more than a Magic 8 Ball. And John, being "an adult male", let him purchase it. Karl bought . . . It makes 15 different farts, has a wireless remote control, comes with sticky tape in case you want to permanently mount it under the chair where guests are most likely to sit, and has (I am SO not kidding) a BASS BOOSTER for longer farts and increased volume. Was I annoyed with John for letting him buy it? Signs point to yes. Without a doubt. You may rely on it. It is decidedly so. As I see it, YES! In some respects, though, it accomplished the original purpose of making them stop fighting. Neither kid has any interest in the Magic 8 Ball now that ol' Farty has joined the family. Sneaking it under a parent's chair is the height of hilarity. Their endurance for Farty rivals their endurance for the Banana/Orange knock-knock joke. Never. Gets. Old. Actually, that isn't true. The novelty of Farty has waned the last couple of days, thank goodness, and I almost feel secure hosting cookie training for Emma's troop and parents next week without the horror of a bass-boosted emission coming from under a parent while a bespectacled giggling boy, completely unaware of his near-death status, pops up from behind the couch holding a remote control. Now I said the novelty of Farty has waned . . . for the children, that is. Last night I was in bed reading when John came up. I didn't pay much attention as he fumbled around by his nightstand and then headed to the bathroom. A moment later there was a loud, er, "sound" from under the covers. "What's that you said?" he called out from the bathroom, with admirable composure. He was really quite proud of his little joke. He recovered Farty and then pressed the button enough times to let me hear each of the 15 farts. "Where's the short one?" he lamented, pressing the button again and again. So apparently he has all the sounds memorized. Can't remember trash day, but he knows everything about ol' Farty. I just rolled my eyes and didn't laugh a bit, because I do not dignify fart and poop humor with laughter, that's why. I dignify it with a blog post. I love DVD's. They're a completely brilliant invention. No more rewinding, no more tape-jammed-in-VCR, better quality, better sound and . . . bonus features! Now I generally adore the bonus features, especially for animated films where you get to see the actors/actresses creating the voices. (Yzma really resembles Eartha Kitt!) ala Kronk: "Yeah. Weird." You can also watch interviews with the cast and crew, hear the director's vision, understand the challenges, etc., etc. It seems all good, but then there are times when you just learn too much. Take the new anniversary edition of The Sound of Music, for instance. Now I love this movie. I've watched it too many times to count and every time is just wonderful. Sure, there are a couple of cheesy parts (all the guests at the ball singing "Goodbye" to the children, Maria breaking into song right in the Captain's face when learning that he loves her, etc.) but overall it is just a delightful movie. I was excited to get the double-DVD set for Christmas and watched the movie and all the bonus features in one marathon sitting. You learn a lot about the real Von Trapps. It ain't all raindrops on roses and whiskers on kittens! For example, Maria was pretty darn bossy and her children were kept isolated and laden with chores on the family farm once they reached America. It was a marriage of duty more than love and the kids weren't thrilled about it. What?! But I thought Leisl liked calling her "Mother"?! Maria had all that sage advice for her after Rolf dumped her. Solid relationship advice that Maria obviously picked up while studying to be a nun, or perhaps from her wicked childhood and miserable youth. How could that not be real?! Oh! And the actress playing Leisl was not "sixteen-going-on-seventeen." She was TWENTY-ONE! And they let little Gretel participate in the boat scene despite the fact that she couldn't swim. They got over that little obstacle by instructing Julie Andrews to grab her before she sunk, drowned, stopped breathing - whatever. She vomited all over Louisa after swallowing too much water, but nobody seemed aghast. Ha ha ha. Gretel almost drowned. Ha ha ha. What a funny memory. Good times. Yikes. Plus, seeing all the children as grandparents, Christopher Plummer looking like one foot and 4 toes in the grave, learning the *true* story of the von Trapps - well, let's just say there's been taintage. Too much information is not a good thing. I would have been happier in my little bubble not knowing the extent of "loosely" in the phrase "loosely based on." Despite my abject horror and disillusionment, though, I'll still watch bonus features. I. just. can't. resist. The kids went back to school today! Oh glorious, glorious, beautiful, quiet day! It allowed me to finish up a layout that I started a couple of weeks ago at a play date with Ev. I'll post it here along with the other layout I did that day. They were just for fun - it's nice to use products from other companies when I get a chance.